Bite-Sized: Highway | Wake up, Meeples! Gaining all of the Provinces gets a lot easier when they don’t cost so much, so whenever there’s a cost reduction effect around, the potential for huge turns should be on your radar, as it is the most common cause of these types of “megaturns.” Highway is very powerful because this effect is attached to a cantrip, making it relatively easy to play a lot of them. The main synergy with Highway that you’re looking for is extra buys or gains. You can eliminate the need for village support by looking for non-terminal synergies like Seaway, other cantrip +Buy, or Ironworks. 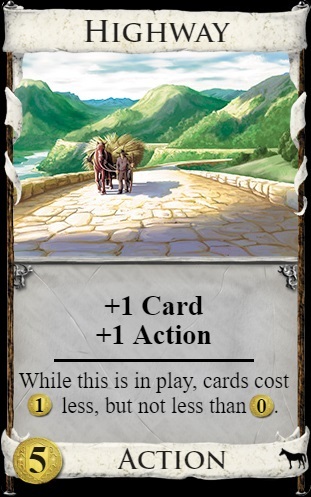 To take full advantage of these, you really want some trashing because it eliminates the need for draw on top of already not needing a village.